Among this year’s crop of researchers is applied mathematician, Dr. Nazish Shahid who works in the Department of Mathematics at Forman Christian College (FCC), Lahore and who also happens to be heading to Princeton University on the Fulbright Scholar grant! We spoke to her about her success and what she hopes to accomplish during her fellowship. How do you think this fellowship will contribute to your future success? Working in a scientifically advanced lab and a competitive research atmosphere will not only expose me to the latest research trends, but it will also motivate me to achieve the objectives of my research in applied mathematics. Also, the fellowship will allow me to consult with other academics in my field, thereby strengthening my research focus, which is imperative if I am to translate the results of my study into practical applications that can find use in science, engineering, business, computer science, and industry in Pakistan. I am hoping that these connections will pave the way for future collaborations. I believe that working in one of the most respected and recognized institutions in the world (Princeton University), also known for its profound history in art and culture, will give my self-confidence a boost and help me better understand the incredible cultural diversity in our world. What will you be studying at Princeton? Is it just lectureship or will you be undertaking research? If so, what is the proposed subject of your research? I will be conducting postdoctoral research in Applied Mathematics at the School of Engineering and Applied Sciences in Princeton. Basically, it is about simulation of unobstructed fluid flow through micro-diametric channels. In this regard, I will be studying polymeric/ complex fluids to investigate the instabilities of flow caused by shear stress induced on fluid and mass-molecular movement through a narrow tubular channel. In layman’s terms, I’m investigating the movement of certain fluids through small pipes with practical applications, for instance, in medicine where we are concerned with the movement of blood through a narrow artery. Meet Fulbright Scholar Dr. Nazish Shahid. Assistant Professor and Adviser, Dr. Nazish Shahid, distributing certificates at Infinity 101, a math contest organized by Undergraduate Mathematics Society at FCC, Lahore. Where are your professionally? Academically? Armed with a PhD in Mathematics from Government College University, I’m presently living the life of a happy academic! I work in the Department of Mathematics at FCC where my responsibilities include lectures, research, advising math majors and freshmen alike, in addition to various other scholarly pursuits that come with teaching and writing for a living. I’ve also been serving as an adviser to the Undergraduate Mathematics Society at FCC. The aim of the society is distill the fear of math from students’ minds, enhance their abilities in quantitative skills and to give them an idea of the practical applications of math in daily life. For me math is not just something that I chose to base my career on. It’s a beautiful language that speaks of symmetry and the reason of everything that came into being. Crazy though it may sound, but working out a difficult mathematics problem never ceases to make me happy and I just can’t get enough of it! What are a few things you’re hoping to do (culturally) on your visit to the U.S.? I’m really looking forward to everything! Actually, a few days after I arrive, plans are afoot to take a bus tour of one of the greatest cities in the world: New York City. This tour will take us to visit NYC’s most famous attractions and diverse neighborhoods that make up Manhattan. Christmas and its festivities are what I am really looking forward to enjoying. Visits to cultural and educational centers, theaters and museums are also on my to-do-list. Being fond of travelling, eating and meeting people of different cultures, I will find time to do all three in whichever U.S. state I am in at the time. Anything else you’d like to share about your professional/ academic life that has contributed to your present success. Continuous support to pursue my career from an amazing set of parents who trusted and believed in me, great teachers without whom I wouldn’t be where I am today, cooperative colleagues and loving friends are few things, among many, that I can never thank Allah enough for. Most importantly, I believe that you always get what you strive for, irrespective of the obstacles before you. It was my strength of will to utilize my full potential that played a key role in making me who I am today. I learned to fight failures and disappointments with the belief in Allah, that I will get what I am destined to receive – I just have to continue putting my due share of struggle. We wish you every success in your research, Dr. Nazish. Can’t wait to hear about all your experiences when you return! 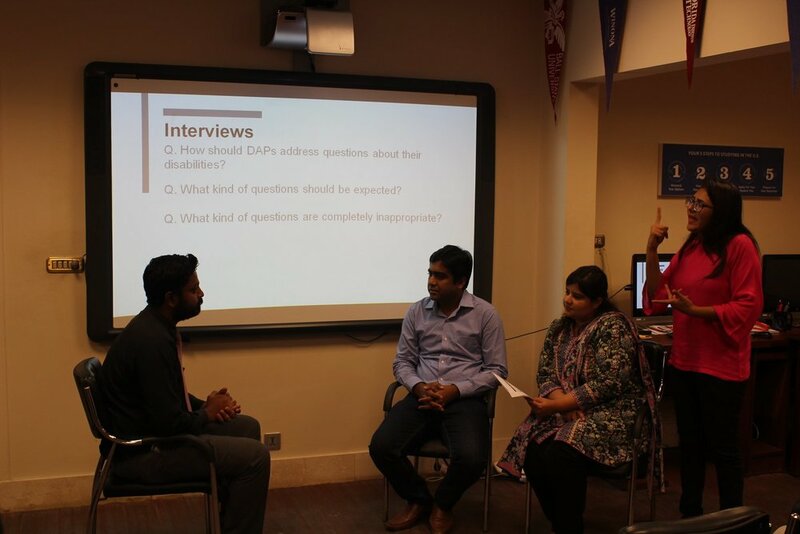 Scholars selected for this grant are expected to share information about Pakistani society and culture with students, colleagues and community groups in the U.S. On returning to Pakistan, Fulbright scholars are expected to make a significant contribution to Pakistan’s development and share their U.S. experiences with students, colleagues and community groups in Pakistan. **Please note: While the current application cycle for the Fulbright Scholar program is closed, this should not discourage you from visiting the USEFP website for details on next year’s competition which opens in October 2016. Learn more about the program here.